The Book of Jeremiah (Hebrew: ספר יִרְמְיָהוּ‎‎; abbreviated Jer. or Jerem. in citations) is the second of the Latter Prophets in the Hebrew Bible, and the second of the Prophets in the Christian Old Testament. The superscription at chapter 1:1–3 identifies it as "the words of Jeremiah son of Hilkiah," and places the prophet historically from the reforms of king Josiah in 627 BCE through to the assassination of the Babylonian-appointed governor of Judah in 582. Of all the prophets, Jeremiah comes through most clearly as a person, ruminating to his scribe Baruch about his role as a servant of God with little good news for his audience. Jeremiah is written in a very complex and poetic Hebrew (apart from verse 10:11, curiously written in Biblical Aramaic). It has come down in two distinct though related versions, one in Hebrew, the other known from a Greek translation. Scholars have had differing opinions as to how to reconstruct the historical aspects of the Book of Jeremiah due to the differences each version contains when compared with each other. The book is a representation of the message and significance of the prophet substantially intended for the Jews in Babylonian exile: its purpose is to explain the disaster as God's response to Israel's pagan worship: the people, says Jeremiah, are like an unfaithful wife and rebellious children: their infidelity and rebelliousness make judgement inevitable, although restoration and a new covenant are foreshadowed. The background to Jeremiah is briefly described in the superscription to the book: Jeremiah began his prophetic mission in the thirteenth year of king Josiah (about 627 BCE) and finished in the eleventh year of king Zedekiah (586), "when Jerusalem went into exile in the sixth month." During this period, Josiah changed the Judahite religion, Babylon destroyed Assyria, Egypt briefly imposed vassal status on Judah, Babylon defeated Egypt and made Judah a Babylonian vassal (605), Judah revolted but was subjugated again by Babylon (597), and Judah revolted once more. This revolt was the final one: Babylon destroyed Jerusalem and its Temple and exiled its king and many of the leading citizens in 586, ending Judah's existence as an independent or quasi-independent kingdom and inaugurating the Babylonian exile. The book can be conveniently divided into biographical, prose and poetic strands, each of which can be summarised separately. The biographical material is to be found in chapters 26–29, 32, and 34–44, and focuses on the events leading up to and surrounding the fall of Jerusalem to the Babylonians in 587; it provides precise dates for the prophet's activities beginning in 609 BCE. The non-biographical prose passages, such as the Temple sermon in chapter 7 and the covenant passage in 11:1–17, are scattered throughout the book; they show clear affinities with the Deuteronomists, the school of writers and editors who shaped the series of history books from Judges to Kings, and while it is unlikely they come directly from Jeremiah, they may well have their roots in traditions about what he said and did. The poetic material found is found largely in chapters 1–25 and consists of oracles in which the prophet speaks as God's messenger. These passages, dealing with Israel's unfaithfulness to God, the call to repentance, and attacks on the religious and political establishment, are mostly undated and have no clear context, but it is widely accepted that they represent the teachings of Jeremiah and are the earliest stage of the book. Allied to them, and also probably a reflection of the authentic Jeremiah, are further poetic passages of a more personal nature, which have been called Jeremiah's confessions or spiritual diary. In these poems the prophet agonises over the apparent failure of his mission, is consumed by bitterness at those who oppose or ignore him, and accuses God of betraying him. Jeremiah exists in two versions, a Greek translation, called the Septuagint, dating from the last few centuries before Christ and found in the earliest Christian manuscripts, and the Masoretic Hebrew text of traditional Jewish bibles – the Greek version is shorter than the Hebrew by about one eighth, and arranges the material differently. Equivalents of both versions were found among the Dead Sea Scrolls, so that is clear that the differences mark important stages in the transmission of the text. 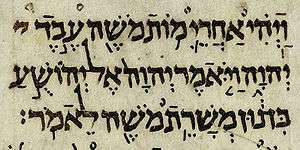 Most scholars hold that the Hebrew text underlying the Septuagint version is older than the Masoretic text, and that the Masoretic evolved either from this or from a closely related version. The linguistic profile of the supplementary material found in the Masoretic text seems slightly later than that of the shorter version, which supports many scholars’ understanding that the Masoretic Text is an expansion of the Vorlage of the Greek version. The longer text was apparently developed to replace the shorter; the shorter version ultimately became canonical in Greek Orthodox churches, while the longer was adopted in Judaism and in Western Christian churches. Scholars have identified several passages in Jeremiah that can be understood as "confessions;" they occur in the first section of the book (chapters 1–25) and are 11:18–12.6, 15:10–21, 17:14–18, 18:18–23, and 20:7–18. In these passages, Jeremiah expresses his discontent with the message he is to deliver, but also his steadfast commitment to the divine call despite the fact that he had not sought it out. Additionally, in several of these "confessions," Jeremiah prays that the Lord will take revenge on his persecutors (for example, Jeremiah 12.3). Jeremiah's "confessions" are a type of individual lament. Such laments are found elsewhere in the psalms and the Book of Job. Like Job, Jeremiah curses the day of his birth (Jer. 20:14–18 and Job 3:3–10). Likewise, Jeremiah's exclamation "For I hear the whispering of many: Terror is all around!" (Jer. 20:10) matches Psalm 31:13 exactly. 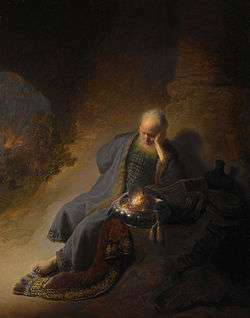 However, Jeremiah's laments are made unique by his insistence that he has been called by Yahweh to deliver his messages. These laments "provide a unique look at the prophet's inner struggle with faith, persecution, and human suffering". Prophetic gestures, also known as sign-acts or symbolic actions, was a form of communication in which a message was delivered by performing symbolic actions. Not unique to the book of Jeremiah, these were often bizarre and violated the cultural norms of the time (e.g. Ezekiel 4:4–8). They served the purposes of both drawing audience and causing that audience to ask questions, giving a prophet the opportunity to explain the meaning of the behavior. The recorder of the events in the written text (i.e. the author of the text) had neither the same audience nor, potentially, the same intent that Jeremiah had in performing these prophetic gestures. Jeremiah 13:1–11 The wearing, burial, and retrieval of a linen waistband. Jeremiah 16:1–9 The shunning of the expected customs of marriage, mourning, and general celebration. Jeremiah 19:1–13 the acquisition of a clay jug and the breaking of said jug in front of the religious leaders of Jerusalem. Jeremiah 27–28 The wearing of an oxen yoke and its subsequent breaking by a false prophet, Hananiah. Jeremiah 32:6-15 The purchase of a field in Anathoth for the price of seventeen silver shekels. Jeremiah 35:1–19 The offering of wine to the Rechabites, a tribe known for living in tents and refusing to drink wine. This was done in the Temple, which is an important part of the breaking of societal norms. 1 2 Sweeney 1998, p. 81-82. 1 2 Kugler & Hartin 2008, p. 241. ↑ Sweeney 1998, p. 82. ↑ Sweeney 1998, p. 85-86. ↑ Allen 1998, p. 7, 14. 1 2 Biddle 2009, p. 1074. ↑ Coogan 2009, p. 299. ↑ Brettler 2010, p. 173. ↑ Davidson 1993, p. 345-346. ↑ Davidson 1993, p. 345. ↑ Coogan 2009, p. 300. ↑ Sweeney 2010, p. 94. ↑ Blenkinsopp 1996, p. 130. ↑ Williamson 2009, p. 168. ↑ Allen 2008, p. 7-8. ↑ Allen 2008, p. 11. ↑ Sweeney 2010, p. 86. ↑ Knight 1995, p. 65-66. ↑ Blenkinsopp 1996, p. 132, 135–136. ↑ Sweeney 2010, p. 87-88. 1 2 Davidson 1993, p. 347. 1 2 3 Coogan 2009, p. 303. ↑ Perdue 2009, p. 1021. ↑ Friebel 1999, p. 13. ↑ Friebel 1999, p. 88-136. ↑ Redditt 2008, p. 132-133. ↑ Blenkinsopp 1996, p. 134. Diamond, A.R.Pete (2003). "Jeremiah". In Dunn, James D. G.; Rogerson, John William. Eerdmans Commentary on the Bible. Eerdmans. ISBN 9780802837110. Knight, Douglas A (1995). "Deuteronomy and the Deuteronomists". In Mays, James Luther; Petersen, David L.; Richards, Harold. Old Testament Interpretation. T&T Clark. ISBN 9780567292896. Williamson, H.G.M. (2009). "Do We Need A New Bible? Reflections on the Proposed Oxford Hebrew Bible". Biblia. BSW. 90: 168. Wikimedia Commons has media related to Book of Jeremiah.